Map Pics & Massive Mission Maps Database Added! Christmas has come and gone, but as tradition dictates I have once again spent a few hours on adding some more content to this old game. This time I have focused on the single player missions that Cavedog so painstakingly prepared. I've added screen shots of the complete mission maps, the victory screens (where applicable), and rudimentary victory conditions as scripted. On the back of the mission maps development I've completely recoded the multiplayer maps database and added map screen shots of them as well. These screen shots are to 1/16th scale with the exception of the following maps which have been reduced to 880px in width to fit better at most visitor's resolutions. Below is a fine example of Cavedog map-making with their famous Core Contingency map 'Cavedog Links Country Club' 9 hole golf course in all its 1/16 scale glory. 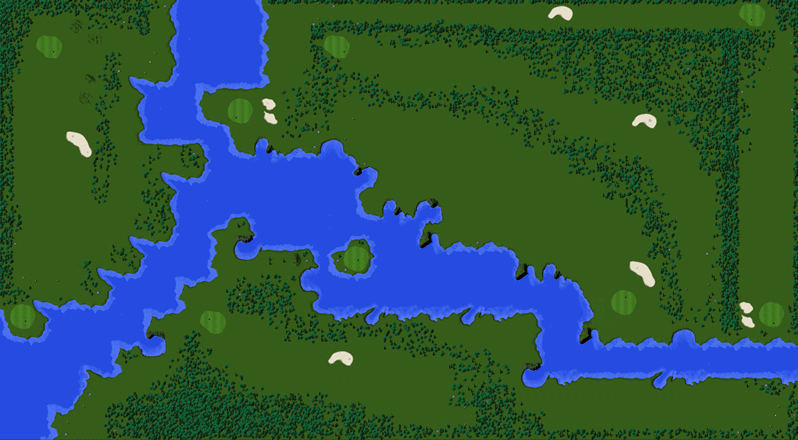 Figure 1: Cavedog's 9 hole masterpiece can now be seen in 1/16th scale along with all other Cavedog maps and missions. The TA Guides General unit page LOS values have been returned to default data values. This assumes the McnTerra-NS.ufo custom AI and LOS patch is used. TA guide unit, map and mission tabs reformatted from html to CSS. Typo in TA guide unit analysis page that caused a database error message has been fixed. Added missing 'Luschious' Cavedog DL map to map pages. Also added it to downloads section. Added comprehensive notes on the variables used - with examples! Added new campaign units section! 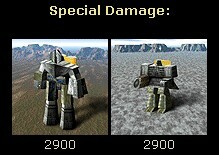 The Special Weapons Damage additions display an image of, and the damage inflicted upon the units. This should help settle those old "OMG my nuke didn't kill your COMM! WTFBBQHAX!!" arguments. 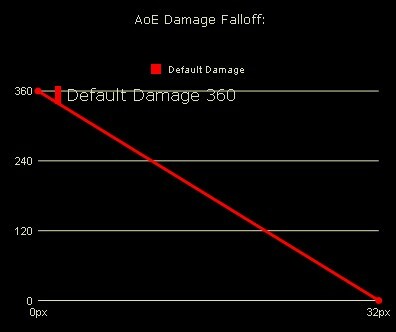 For example, we see that a nuke has special damage just a smidge under the commy's 3000 Default Damage value. Of course were a commander standing beside a factory that also causes him damage when the nuke explodes, well... 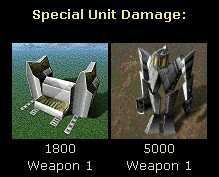 Similarly the Special Units Damage addition shows which units can deal out special damage to the unit being looked at. We see that the mighty Core Sumo (Default Damage=4950)can be dispatched with just a single shot from the Arm Sniper. Probably not the most relevant multi-player information, but there you go... 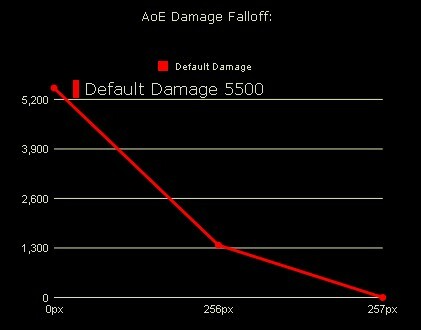 The Area of Effect Blast radius Damage falloff graphs are something I have been wanting to add for a long time. They dynamically show how each weapons' damage (mouse over for actual values) falls off with distance from the point of impact due to the Edge Effectivness value. This is displayed for 2 cases. In both cases the Area of Effect is the diameter to the edge of the blast (Thanks Switek!). Since I am taking the distance from the blast, I take half this value effectively plotting against the blast radius. Unit stats reference notes for each data type have been added. I have linked to examples above, and within the guide pages you can just click on the data description to take you there, or you can find them under the Arm, Core, and Campaign unit pages menu. I also fixed a major bug preventing aircraft mobility data from showing. Corrected the Worker Times to be multiples of 30 (Thought I had done this a long time ago!). And fixed a minor bug in the 'Analysis' page that was sending the server maths errors. Man, time for a beer!